I have confirmed that U-ta-wa-un is not the same person as Layton Kanistanaux, but what about Marleah, who was traveling with U-ta-wa-un in 1870? Is she Marleah Kanistanaux? The jury is still out on this question. Today I will outline what I have discovered to date and how I interpret the material. I encourage my readers to comment. In searching through old books and newspapers (gotta love Google! 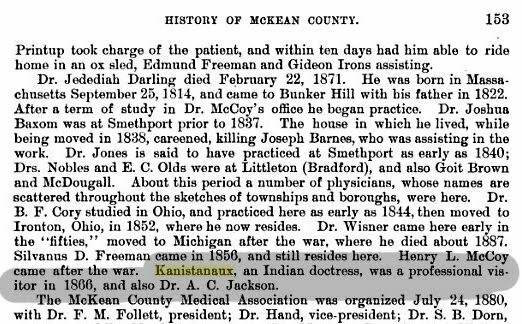 ), the earliest I have found the name Kanistanaux is about 1866 in McKean Co., Pennsylvania as an Indian Doctress who “visited” that year. I found Mrs. Kanistanaux and Dr. Kanistanaux, the “celebrated Indian Doctress” in 1870 and 1871 advertisements in Corning and Naples, NY newspapers. I believe this doctress is Marleah Kanistanaux, but this is based on my gut and not on documentation. It could be one of the others or it could be someone I have not yet discovered. Marleah Kanistanaux is never listed in any census record as a doctress or physician, but I do have the brochure from the Stockton history. The brochure mentions her mother has recently passed away which would place its printing around 1875, since her mother died in late 1874. The brochure uses the spelling “Mar-le-ah”. In the 1875 NY State census her name is Marleah. On Wednesday, Aug. 16th, Marleah the Indian Doctress will be at L. L. Sutton’s where she can be consulted free of charge. She has had years of experience and uses vegetable medicines entirely. She brings plenty of certificates of her success in chronic diseases. Afflicted females will find especial pains taken in chronic cases and should call at once. During the period of 1877 to 1879, I found only mentions of “Mar-le-ah “The Wild Flower”” appearing with U-ta-wa-un. In each of these, she is referred to as his sister and her name is spelled “Mar-le-ah” with the dashes as found in the Stockton brochure from this same time period. Following is the text from those news clipping. A grand entertainment will be given at the M.E. church Marlborough on Thursday evening, February 8th. Dr. U-ta-wa-un and sister will be present dressed in complete Indian costume. The Doctor will give a historical address upon “The Manners and Customs of American Indians. Mar-le-ah, “The Wild Flower,” will interest the audience with subjects adapted to the occasion. There will be dialogues, tableaux and choruses. Admission 10 cents. At the conclusion an oyster supper and other refreshments will be served in the basement of the church. Sleighing parties will do well to remember this point of attraction on Thursday evening. Dr. U-ta-wa-un – The celebrated Indian King of Medicine, after several years’ absence has returned to visit his old friends and patients in this vicinity without losing any of his former skills as a medicine man. – His [__?] in this village has recently been proved by removing a tape worm from Mr. John Dewey, and at Gloversville by the same operation for Mr. Richard Gwillan, which had grown to the enormous length of 171 [not sure of the number but it is 3 digits] feet! It is the longest on record. He is accompanied by Mar-le-ah (or Wild Flower) and they are prepared to treat all chronic diseases; as also female derangements, and all diseases incident to female nature. The Doctor treats successfully, as taught by his native and other Indian tribes. They may be consulted at the Sir Wm. Johnson House on Tuesday of each week. The young people – and some older ones, too – were greatly excited a few days ago over the arrival of Dr. U-ta-wa-un, the Great Indian King of Medicine, who with his sister, are stopping at the Clyde Hotel. The doctor advertises to give a free lecture at the Hall, Tuesday evening on medicine and disease. His sister, Miss Mar-le-ah will also lecture during the evening. 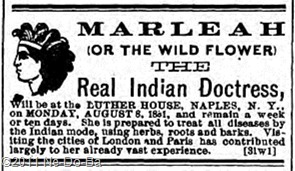 The next appearance of Marleah is from a Naples, NY newspaper ranging from November 1880 to August of 1881 where she is generally referred to as “Marleah, the Indian Doctress”. These ads usually provide only dates and locations where she can be consulted. Included in this last newspaper series is this wonderful little gem. This is the only time I found her using “The Wild Flower” while she is traveling alone, but it is also the only “business ad” I found. It does help to establish this Marleah as the same person traveling with U-ta-wa-un in 1877 and 1879. If she traveled with him in 1877-79, it stands to reason, she is very likely the person with him in the 1870 Census. The newspaper trail for the Doctress Marleah stops at this point. Unfortunately, my research is limited to the newspapers available online. The picture painted may not be complete. If I had access to more newspapers, I might find additional information. I might discover an overlap between ads suggesting there had to be two different people. At this point in time and based solely on what I do have for information, I believe there is one Native doctress known in New York State using the names Marleah and Mar-le-ah. She did travel at times with U-ta-wa-an. This doctress appears to be the same person as Marleah Kanistanaux, known to reside in Stockton, NY. She is probably the same woman known as Dr./Mrs. Kanistanaux who traveled within the same general area at a slightly earlier time. I believe the record I have uncovered represents several different phases in the development of the public career of one Native American Doctress during the 2nd half of the 19th Century. She began as a simple healer and probably using her own name. This perhaps was proper “white” etiquette for profession ladies of the time period. About 1870, she met up with a man named U-ta-wa-un, who knew the ropes of the business, so-to-speak, and perhaps shared some of his business tips with her. He moved on to another region for a while then returned and traveled with Marleah a few times over the next a year and a half (he is also found alone during this same period). She probably adopted the more colorful name “Mar-le-ah (the Wild Flower)” for her advertising as a result of this man’s influence. They appear to be traveling in a wider region and appearing in larger cities then when she is alone. He moved on once again and she went back to working alone as a simple healer. Traveling as an Indian Doctress would have been a very hard life for untold number of reasons, including bigotry and discrimination. In 1881 she was about 54 years old, and perhaps retired from the rigors of constant travel. She and her husband had recently purchased land in Stockton and were attempting to farm. A decade later I find (1892 census and thereafter) she has reverted to using the simple name Mary, which I believe may be her true birth name. I do want to point out to my readers that “U-ta-wa-un” and “Mar-le-ah” are stage names, and may have nothing to do with their birth names or the names they were known by to family and friends. He is most definitely a showman giving “performances” to the public as a means of selling his medicines. I believe this activity is an early version of the “Traveling Medicine Show” which some readers may remember from old TV westerns. They really did exist and I believe may have started with Native People here in the Northeast. The Penobscot Newell family and Frank “Chief Big Thunder” Loring were providing “public entertainments” prior to the Civil War as a means of surviving. The selling of “Indian” baskets, crafts, and medicine to non-Native customers generally accompanied such entertainments. Was Marleah the sister of U-ta-wa-un, as stated in the news articles? Probably not. It is my belief this is just part of the act. At this time in history, it was certainly improper for adult men and women to travel and room together unless they were married or relatives (such as siblings, uncle & neice, etc.). However, I certainly will not rule out the possibility they are related. Layton & Marleah Kanistanaux have not been located in any census or other vital records (US & Canada) prior to their appearance in the 1875 New York State Census in Stockton. The name Marleah is not common. There are not a lot of Indian Doctresses roaming around the countryside, so it seems very unlikely I would find two with the same unusual first name. She is not referred to as the wife of U-ta-wa-un at any other time except the census entry for 1870. The spelling of the name Marleah as found in the advertising brochure mentioned in the Stockton history from about the 1875 time period as “Mar-le-ah”. The name given to the Indian Doctress found traveling with U-ta-wa-un and claimed to be his sister in 1877 is “Mar-le-ah”. It is exactly the same and seems like too great of a coincidence. Marleah & Layton claim to have married about 1855. Layton is identified as a Doctor. Why isn’t Layton found traveling with Marleah? She may be related to U-ta-wa-un, who claims to be from California or Illinois, or that he is Choctaw – this is not consistent with the data currently associated with members of the Kanistanaux family. They all claim New York or Canada as their origins and Seneca, Brothertown, or Abenaki as their tribe. Mary Kanistanaux could have taken the name Mar-le-ah from another woman who was already known in the region and therefore acquiring a following based on the other woman’s reputation. I haven’t found anything that would actually rule out the possibility of these ladies being the same women. However, I have found nothing concrete to support this conclusion either. Perhaps something will turn up in the future.